The issue of money in politics got a lot of media attention this summer when Republican Rep. Gabrielle LeDoux formed Gabby’s Tuesday PAC. It’s the first political action committee in Alaska controlled by an individual legislator. 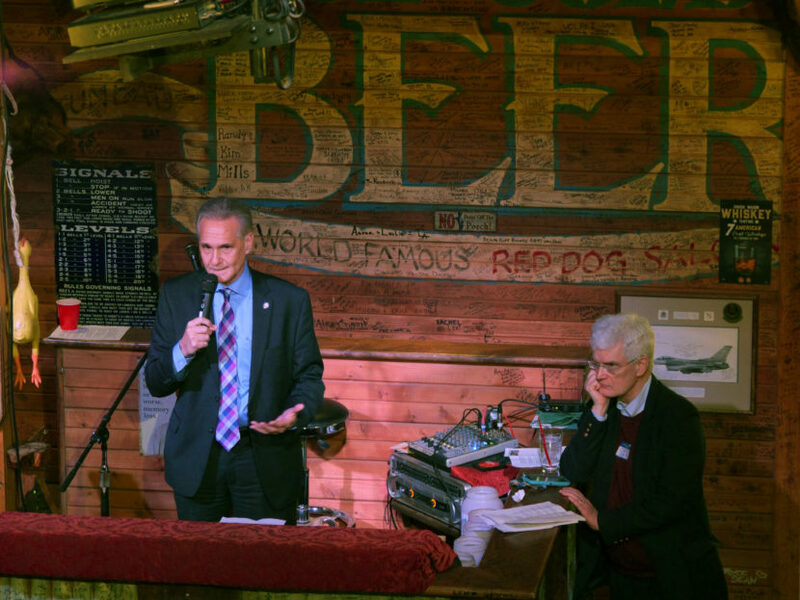 Former Alaska Senate President Kevin Meyer is going after PACs such as LeDoux’s in what he said is an effort to improve public trust. Meyer hopes to change Alaska’s campaign finance law to address PACs controlled by individual lawmakers and candidates. “Senate Bill 5 will close the loophole that allows lobbyists to contribute to political action groups that are controlled by a legislator or a candidate for the Legislature and places a restriction on when these groups can engage in political fundraising,” Meyer said at a Jan. 31 public hearing. Under Alaska’s 1996 campaign finance law, candidates and elected officials are not allowed to receive contributions from lobbyists outside their home district, and they are not allowed to fund raise during the legislative session. SB 5 would extend these same rules to PACs controlled by individual legislators. PACs like LeDoux’s cannot contribute to the candidate or legislator that controls them, but Meyer said it’s the appearance of impropriety that worries him. “I just think that the inference of misbehavior is so great,” Meyer said “Whereas when it goes to other parties where I as the legislator can’t control, then that’s kind of out of our hands,” he said when asked about lobbyist contributions to PACs controlled by political parties versus individual legislators. Democratic Sen. Bill Wielechowski is a strong proponent of campaign finance reform. He supports Meyer’s bill in principle, but thinks it could go much further. Wielechowski is actively working on an amendment to SB 5 to make it more comprehensive. A lot has been made of the Gabby’s Tuesday PAC, but LeDoux has pushed back, saying it’s no different than PACs run by state political parties. Casey Reynolds, a former GOP spokesman-turned-blogger, agrees with LeDoux’s position. “Each political party, the Republican and the Democrat have groups, have PACs that are set up to support House Democrats, House Republicans, Senate Democrats, Senate Republicans, and so those caucus leaders can raise money into those PACs from the same interests that Gabrielle LeDoux is raising money into her PAC from, and then distribute it out to people as they see fit to people who are aligned with them,” Reynolds said. In Reynolds’ opinion, the bill isn’t really an effort to get money out of politics, but rather an attempt by the state’s political parties to maintain power after LeDoux and two other Republicans joined forces with 17 Democrats and two independents to form a new majority in the House this year. It’s the first time since 1993 that a Republican has not held the top position in that chamber. LeDoux refused to speculate about the underlying motivations of Meyers’ bill, but she did acknowledge the shifting power dynamics between individual lawmakers and political parties. She thinks it’s a positive development. “I think sometimes the parties have too much influence in politics, and so if more people had individual PACs, that could kind of curtail some of the influence that the parties had on people,” LeDoux said. Senate Bill 5 is scheduled for public testimony at its next hearing in the Senate State Affairs Committee on Thursday, Feb. 9. Previous articleWhat road lies ahead for Juneau’s electric cars?